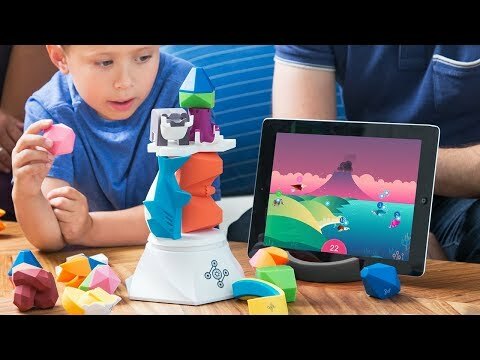 Build a tower and an entire ecosystem of animals in this digi-physical beast balance game. 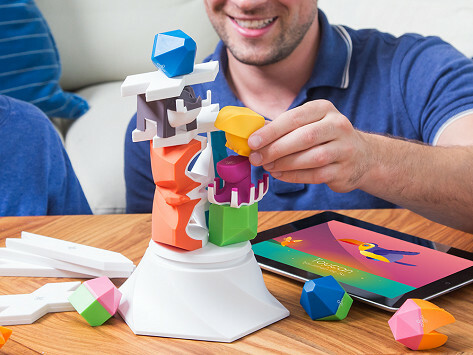 Touch the pieces to the Plinth and they come to life in the game’s app. The goal is to stack all of the pieces on the Plinth and avoid the volcano destroying the world you’ve built. Earn more points by evolving, creating, and migrating animals and adding tough-to-stack pieces to the structure. Dimensions: 11.8" x 11.8" x 5.1"
Killer Gift for kids...and their adults. Create a digital world of never-before-seen creatures and magical “artefacts” in this app-connected beast balance game. Building the tallest tower you can is just part of the challenge. The balancing act extends to a bunch of animals and their personalities. The Plinth—the game’s physical base—is what you build on. Place a beast (which doubles as a building block) on the Plinth, and it appears on screen in the app. From there, players introduce more beasts, which add complexity. Create hybrid animals for more points. Lower-point earning beasts get jealous of higher-point ones, which make those envious animals drop their points and could cause them to become endangered or even go extinct. Feeling adventurous? Add in miracle pieces to unlock challenges that boost your points. But be careful—they don’t stack easily. If the structure falls, you’ve got 10 seconds to reconstruct the tower before a volcano explodes and ends the game. When our first tower fell, we didn’t beat the volcano. But we immediately wanted to see if we could build a better tower, beat our high score, and create a new, creature-inhabited world.